Authorities have identified an American suspect in the killing of a Thai national whose battered body was found bound, gagged and wrapped in plastic on the side of a road in a high-profile case in Australia, according to a federal search warrant obtained Tuesday. 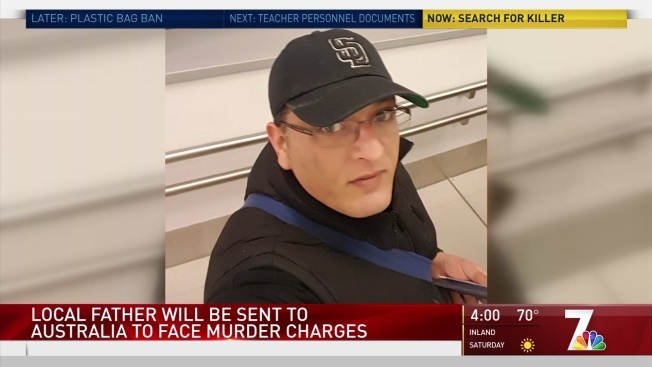 Australian authorities issued an arrest warrant for Alex Dion in the killing of 33-year-old Wachira "Mario" Phetmang, whose body was found on the side of a freeway in the suburb of Sydney Olympic Park in June 2018. The arrest warrant for Dion was issued in September 2018 while he already was in custody on a domestic violence charge in San Diego, according to the federal search warrant filed by the FBI on Friday. The warrant, which marks the first time a suspect has been publicly named in Phetmang's killing, was first obtained by Seamus Hughes, a terrorism researcher at George Washington University who mines federal court databases. Dion, 38, was set to be extradited from San Diego to Australia this coming Friday, according to the warrant. It's unclear whether he has an attorney. Phetmang and Dion left the gas station together in Dion's car, according to the surveillance footage, and that was the last anyone saw of Phetmang. Dion flew back to the U.S. two days after Phetmang's death but before the body was found on June 6, according to the search warrant. A boot police believe belonged to Dion was found with Phetmang's body, and the matching boot was later found in Dion's apartment, the search warrant said. Police also believe Dion used a high-pressure washer to scrub the inside of his car, and dumped both his and Phetmang's clothing, two tire irons and a metal bar inside a water-retention tank where he used to work. When Australian police held a news conference seeking the public's help in the case, Dion called them and tried to blame an associate for Phetmang's killing, while also acknowledging that he had Phetmang's credit cards and cellphones with him in San Diego, according to the search warrant.